Julian Barling is the Borden Professor of Leadership in the School of Business at Queens University, Canada. He also holds a Queen’s Research Chair. His latest book, The Science of Leadership, has just been published by Oxford University Press. In The Science of Leadership, Julian takes an evidenced-based approach, relying primarily on the knowledge generated from research on organizational leadership conducted around the world and personal reflections based on two decades of involvement in leadership research and leadership development with executives. While leadership has been studied within all the major social sciences, he mainly focuses on findings from psychological research. The first part of the book explains the nature of organizational leadership, responds to the question of whether leaders “matter,” and explains how leadership works. A longstanding issue is whether leadership can be taught. Julian explores the debate over whether leadership is “born or made” as well as the effectiveness of leadership development interventions in organizations. He gives consideration to what can be learned from leadership in other contexts such as sports, the political arena, and schools, and devotes individual chapters to topics that include gender and leadership, destructive leadership, and followership. An outline of the book can be found at: web.business.queensu.ca/faculty/jbarling/index.asp. It is available online through Amazon. 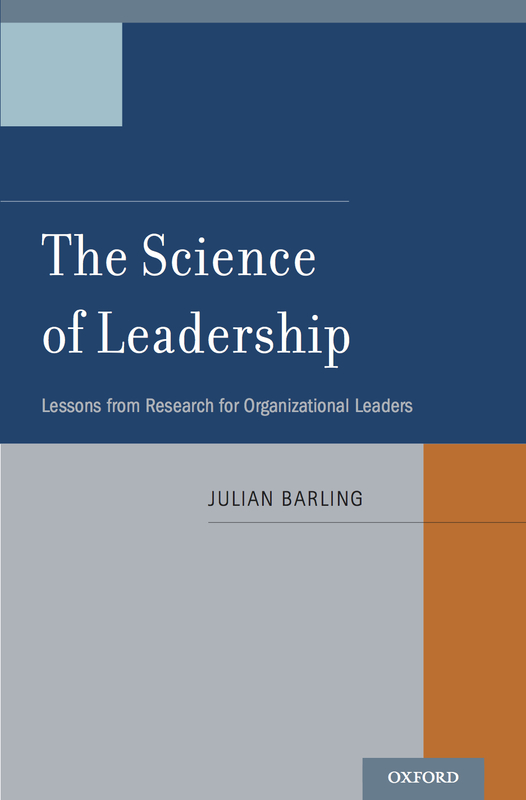 This entry was posted in Uncategorized and tagged Amazon Books, Julian Barling, Leadership, organizational leadership, Oxford University Press, Queen's School of Business Canada, The Science of Leadership. Bookmark the permalink.